Colleges and universities routinely offer scholarships and grants to deserving students as a way of attracting the best and the brightest to their campuses. For student athletes, these financial aid programs offer a way to turn athletic ability into cash for college. The majority of sport specific financial aid comes in the form of scholarships, and most students are well aware of the sizable scholarships offered to exceptional high school football and baseball players. While these scholarships can provide full or partial tuition awards for the lucky recipients, they are extremely limited and the competition is fierce. Very few student athletes are lucky enough to score the full ride scholarship of their dreams. But there are other ways for students to turn their athletic prowess into money for college. Athletic grants offer a way for student athletes to supplement their college fund, while continuing to pursue their favorite sport. These grant programs are particularly helpful for those students whose athletic interests lean less to high profile sports like football and baseball, and more toward sports such as tennis, golf and bowling. Students looking for financial aid for college may find that their extracurricular athletic activities offer a path to valuable education grants. Obviously, the Federal government doesn’t sponsor specific grant programs for college athletes. But they do offer valuable need-base grants that are available to all college-bound students. These financial aid programs can help student athletes supplement their education fund, while getting them to the college that offers the sport programs they desire. Again, while these grants do not specifically target athletes, students should leave no stone unturned when searching for college funding. The Federal Pell Grant is available to all undergraduate students who can demonstrate the requisite level of financial need. The total amount of aid received is determined by a combination of financial need, status as a full time or part time students, and the total cost of attendance at the student’s college or university. The current maximum annual award amount is $5,550. The Federal Supplemental Educational Opportunity Grant is offered to students who have qualified for a Pell grant, but still have a sizable amount of unmet need. While the FSEOG is funded by the Federal government, it is only administered by participating schools. Students must apply through their college or university’s office of financial aid. Award amounts are determined by financial need, total cost of attendance, and status as a full or part-time student. Award amounts range from $100 to $4000. Again, these grants are not specifically aimed at college athletes, but they do offer a way for students with financial need to supplement their college fund. Students who have not qualified for an athletic scholarship can use these grants to defray tuition costs, and get them to their college of choice where they can pursue their sporting ambitions. After exhausting the grant opportunities supported by the Federal government, students should turn their attention to the financial aid programs offered by their own school of attendance. Most colleges and universities offer some form of financial assistance, though student-athletes may need to look beyond their favorite sport and consider general campus-based grants as a way to supplement their college finances. Many college sponsored grants rely on a student’s academic performance and extracurricular activities as deciding factors in final award decisions, and school athletics definitely fall into those categories. Students should contact the financial aid department at their college of choice to inquire about possible grants and scholarships for which they may be eligible. Unlike athletic scholarships, which are primarily sponsored by colleges, universities and national sporting foundations like the NCAA, grants for student athletes may be supported by any number of different sources. Businesses and corporations with ties to the sporting industry often offer college grants for student athletes, as do regional and national athletic associations. Students looking for athletic grants for college will want to start their search by focusing on their sport of choice. For example, a high school tennis player will want to search for businesses or professional associations that support grants for exceptional tennis players, concentrating on manufacturers of tennis equipment, and national and regional tennis associations. The following examples should illustrate the most common types, and sources, of grants for college-bound athletes. The United States Tennis Association offers a wide range of grants for student tennis players, as well as for amateur and professional players. 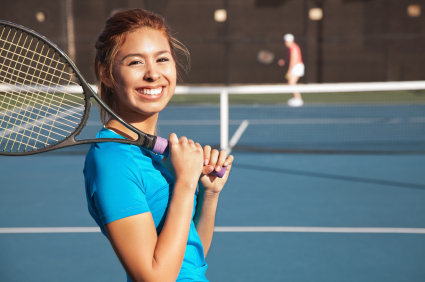 Among the many programs sponsored by the USTA are the Excellence Grant For Boys and the Excellence Grant for Girls which offers up to $5000 to high school tennis players with exceptional ability. Grants are awarded at a number of age levels, and awards can be used to pay tuition costs at any accredited college or university. The United States Bowling Congress supports amateur and professional bowlers at every stage of their development. The USBC offers a wide range of programs for youth bowlers, including a variety of grants and scholarships for exceptional players. Awards are offered in every competing age group, with amounts ranging from $100 to $1000. The American Morgan Horse Association sponsors the annual Graywood Youth Horsemanship Grant . The award is open to student members of the association aged 13 – 21 who have demonstrated an excellence in horsemanship. Grant amounts range from $300 to $500. The National Collegiate Scouting Association was founded in 2000 to help student athletes navigate the competitive world of college recruiting. NCSA sponsors the annual Athleadership Grant which is designed to assist college students in developing their skills and professional athletic potential during college and after graduation. The NCSA also helps student athletes to negotiate additional scholarships at participating colleges and universities. The National Strength and Conditioning Association sponsors a variety of grants and scholarships for both undergraduate and graduate students. While not strictly targeted to athletes, the programs target students pursuing degrees in sports medicine and strength conditioning, two fields which typically attract athletes following their college sporting career. The average award amount is $1500. High profile scholarships for football and baseball players tend to get the lion’s share of attention when it comes to financial aid for student athletes. But for some students, particularly those competing in less high profile sports, grants may provide the answer to their college financial needs. Not every student is a star football player, and very few students can earn a full ride scholarship. If you’re a student athlete, grants may offer the opportunity to turn your talent on the playing field into much needed cash for college. Student athletes should also refer to our sections on Athletic Scholarships for further information on financial aid opportunities.